George Zimmer is the founder of the Men’s Wearhouse chain of clothing retailers. 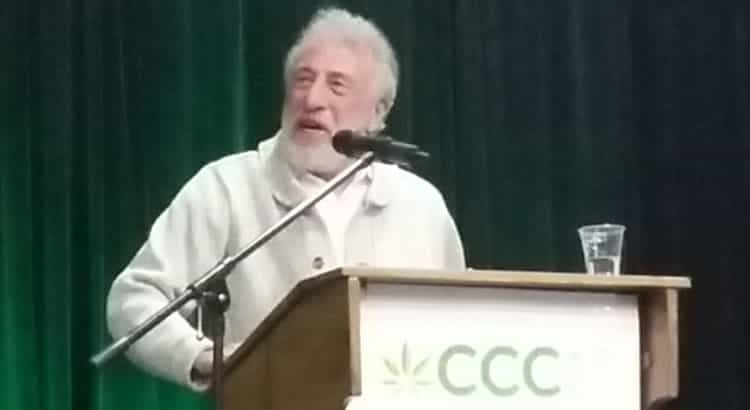 He is also a philanthropist whose donations to California’s Proposition 215 back in 1996 helped to get the nation’s first medical marijuana law passed. Mr. Zimmer was in Portland, Oregon, this morning to deliver a keynote address to the Cannabis Collaborative Conference. In his remarks, he urged the entrepreneurs who were gathered to learn how to profit in the green rush to embrace an ethic he calls “stakeholder capitalism”. Mr. Zimmer emphasized that this fledgling industry can be modeled in such a way as to maximize the result for the marijuana consumer, not just the shareholders in the marijuana companies. Fortune magazine recently reported on an interview with Mr. Zimmer conducted by Business Insider. In the article, Mr. Zimmer admits to what he called a “lifetime passion” for marijuana. Through the years, he used the drug as a crutch as he weaned himself off alcohol. It’s been 35 years since the recovering alcoholic had a drink, and he credits much of his success to his ability to “transfer the addiction” from a potentially dangerous drug to a more benign one. He says that in addition to reducing his dependence on alcohol, marijuana might have even helped him cope after Men’s Wearhouse gave him the boot. Mr. Zimmer was terminated as CEO and spokesperson of the company he founded when Men’s Wearhouse board of directors removed him in 2013. The Cannabis Collaborative Conference continues tomorrow, with single day passes going for $149 and expo-only passes going for $49 at ccc-con.com.